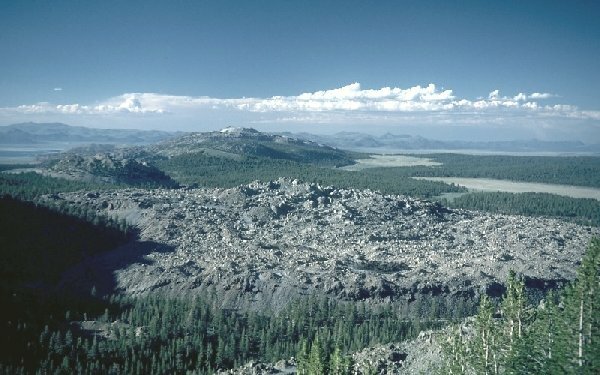 Long Valley caldera, located at the boundary between the Sierra Nevada and the Basin and Range Province, is one of the largest Quaternary rhyolitic volcanic centers in North America. Volcanic activity began in the area about 3.6 million years ago when lava flows covered an area of about 4,000 square km (1,500 square miles). The Long Valley caldera was produced by a catastrophic eruption about 730,000 years ago. 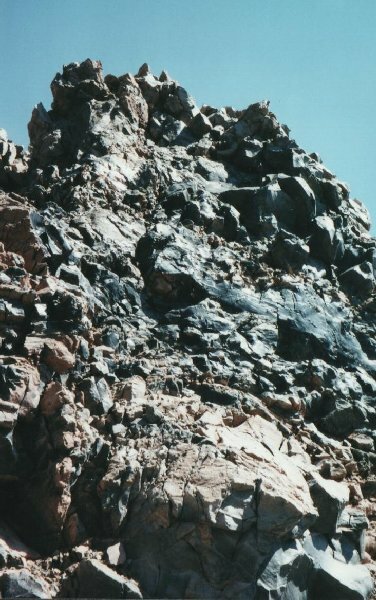 The roof above the magma chamber collapsed, forcing 600 cubic km (150 cubic miles) of rhyolitic magma to the surface in the form of Plinian ash columns and associated air falls and ash flows. After the catastrophic eruption, volcanism continued on the caldera floor, producing a thin layer rhyolitic tephra and lava. Pressure increased within the magma chamber and forced the overlying rocks upward, forming a resurgent dome. The resurgent dome formed within 100,000 years after the caldera. Eruptions 500,000, 300,000, and 100,000 years ago along the periphery of the resurgent dome produced thick, steep-sided rhyolitic lava flows and domes. These volcanic products are the youngest lavas to originate from the magma chamber. Mammoth Mountain, at 3389 meters (11,050 feet), is a composite volcano made up of about 12 rhyodacite and quartz latite domes extruded along the southwest rim of Long Valley caldera from 200,000 to 50,000 years ago. Mammoth Mountain is one of the eruptive centers that developed late in the evolutionary cycle of the Long Valley caldera complex. Volcanic unrest continues at Long Valley. Earthquake activity began in 1978 and culminated in mid-May 1980 when four magnitude 6 events were recorded in a 2-day period. Volcanologists interpreted the earthquakes, accompanying ground deformation, and an increase in activity at fumaroles as an indication of magma movement beneath the caldera. U.S. Geological Survey continues to monitor the caldera. 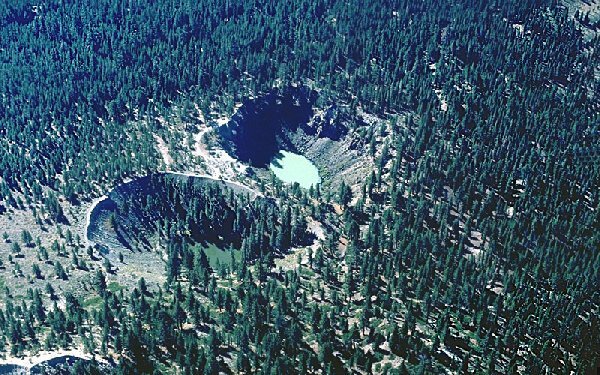 Three large craters comprise the Inyo Craters: Two lake-filled craters (North and South Inyo Craters) and another crater at the summit of Deer Mountain (Summit Crater), the peak to the north. 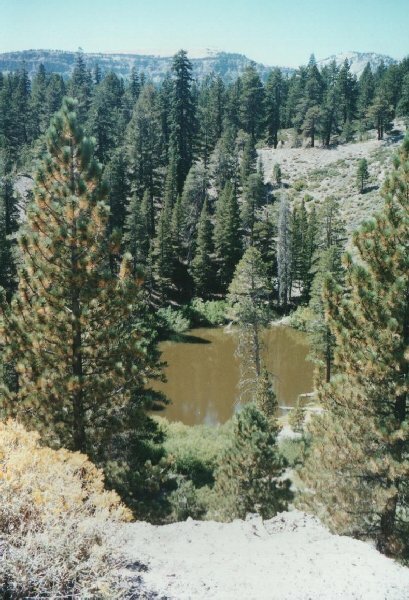 The two craters with lakes (North and South Inyo Craters) are over 184 meters (600 feet) in diameter. The northern crater is about 46 meters (150 feet) deep and the southern one over 61 meters (200 feet) deep. 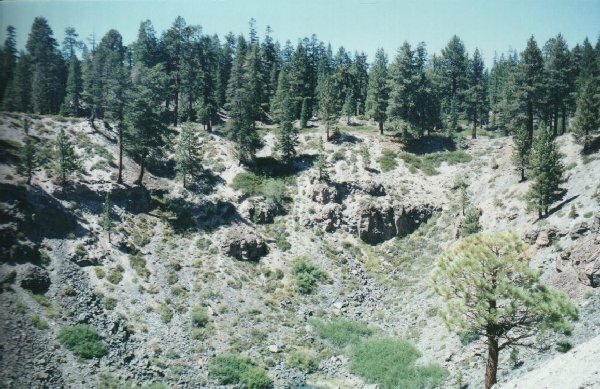 The Inyo Craters chain also includes nine much smaller craters and at least five volcanic domes. Inyo Craters are phreatic explosion craters. They were created about 500 years ago as phreatic explosion pits, rather than typical ash eruptions. The explosive formation of the craters was probably triggered when circulating groundwater was heated by the underlying magma to the point that fluid pressure exceeded confining pressure. The superheated water vaporized and the expanding steam hurled the overlying material upward and outward blanketing the area with a layer of debris up to 15 meters (50 feet) thick. No lava was emitted from this eruption. Such eruptions are termed hydroclastic eruptions because they involve rock fragmented rocks and water. 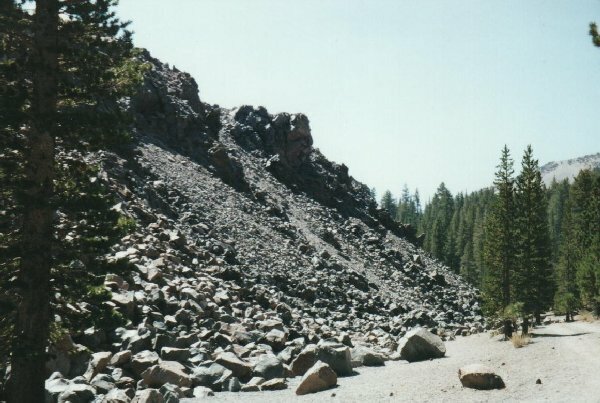 To reach Inyo Craters, turn off of U.S. 395 onto the Mammoth Scenic Loop. Turn off the Scenic Loop at the sign for Inyo Craters. Travel 1.9 kilometers (1.2 miles) to the parking area. Inyo Craters is reached via a easy dirt trail from the parking area. Aerial view of Inyo Craters. Looking down into South Inyo Crater. Crater wall of North Inyo Crater. Looking down North Inyo Crater. 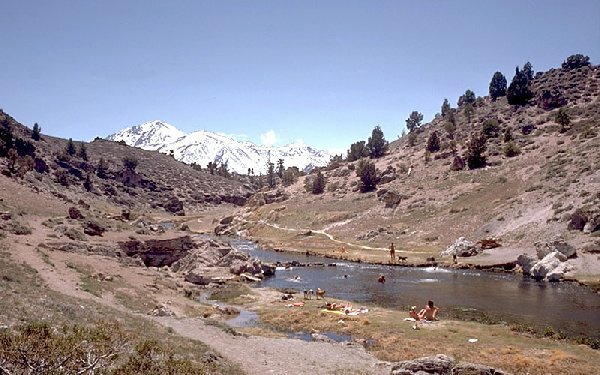 Hot Creek is an active geothermal area in the ancient Long Valley Caldera. The area is alive with steam rising from fumaroles and hot springs along the creek. There are also hot springs discharging directly into Hot Creek near the remains of the bridge that formerly spanned the creek. The mingling of hot spring water with snow-melt fed stream water produces extreme temperature gradients in the creek. The wide range of temperatures has made this area popular for swimming year. 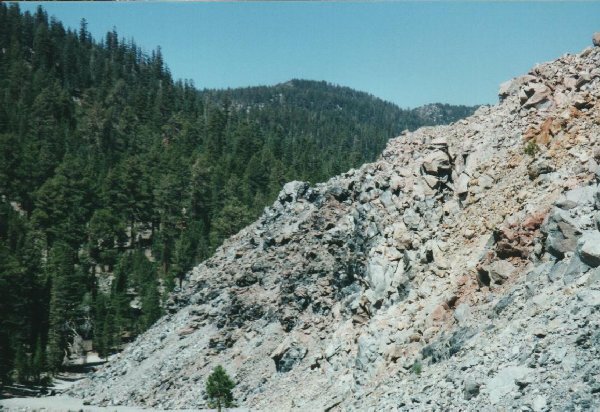 Hydrothermal activity has kaolinized and opalized the the alterated rhyolite rock of the gorge, producing the white, bleached appearance. 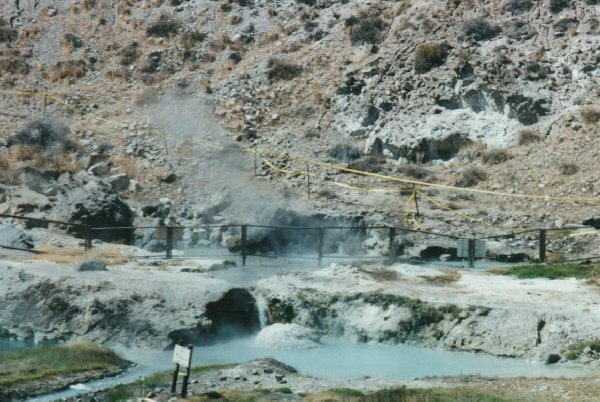 Many of the current hot springs appeared suddenly on the night of August 24, 1973. At least five hot springs formed, with the two largest starting as geysers that spouted water 3 meters (10 feet) into the air. Within weeks geyser activity had waned, but the hot springs remain today. The origin of the new hot springs remains unclear, but it has been noted that they appeared within hours of a relatively small (M=3.5) earthquake 40 kilometers (25 miles) southeast of Hot Creek. Presumably, seismic activity altered the subsurface plumbing system giving rise to the springs. Prior to the small earthquake, heated water was trapped below an impermeable horizon. The seismic event breached the impermeable strata and superheated water and steam rose rapidly initiating geysers at the surface. After the initial pulse of superheated water reached the surface, the heat flux decreased and the geysers become hot springs. 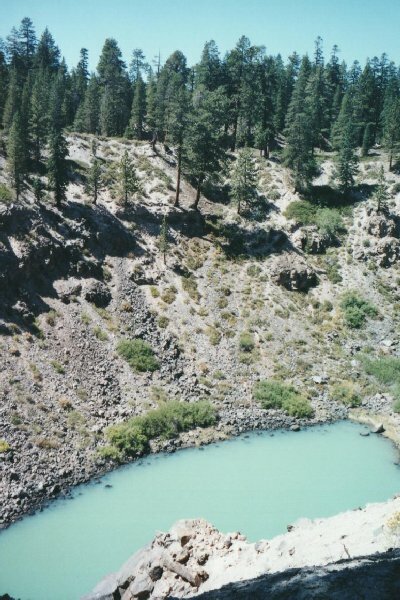 To reach Hot Creek, travel south from Mammoth on U.S. 395. Take the airport exit and turn right. Travel past the Hot Creek Fish Hatchery, continuing east for 3.2 kilometers (2 miles). Park in the parking area and take a short hike to the bottom of the canyon. 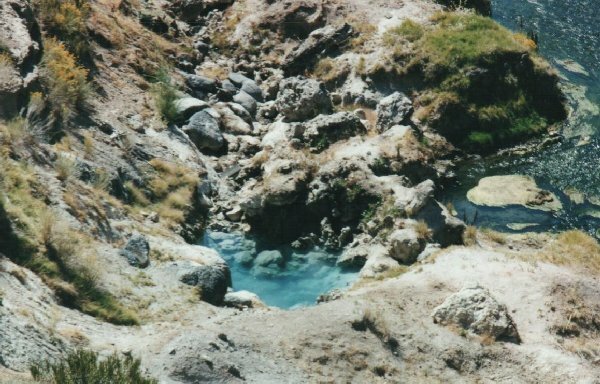 The area is a popular bathing spot, but the hot springs in the creek can change dramatically in temperature, presenting the very real danger of scalding. Boiling pools alongside the creek. Obsidian Dome is one of several domes in the Inyo-Mono Craters chain. It is comprised of flow-banded obsidian and rhyolite extruded as extremely viscous lava, creating domes that locally exceed 92 meters (300 feet) in height. The unexpanded rhyolite is black and glassy whereas the vesiculated blocks are gray. Contorted flow bands with tension cracks are present on most blocks. Ropy textures with iron-staining may also be seen. There is no information on the age of this dome, but most likely it is not older than a few thousand years. Obsidian Dome can be reached from the marked exit off U.S. 395, a few kilometers south of June Lake Loop. Follow the dirt road to the dome area. Aerial view of Obsidian Dome. Another view of the face of Obsidian Dome. Return to the Molossian Institute of Volcanology Main Page.